On Wednesday, 27th January, was visited by three representatives of the Irish Defense Forces, Commandant Michéal O’Mahony, Gunner Paul O’Rourke and Lieutenant James McKeon. They presented the school with an Irish Flag and a copy of the proclamation of the Irish Republic. The ceremony was to celebrate the 100th Anniversary of the 1916 Easter Rising. The flag will be raised on March 15th, Proclamation Day. 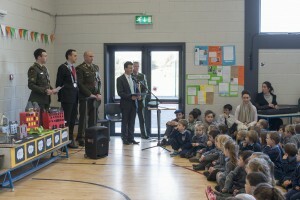 Lt. James McKeonis pictured presenting the oldest pupil Fergal O’Sullivan and the youngest pupil Tomásín Orpen with the flag.